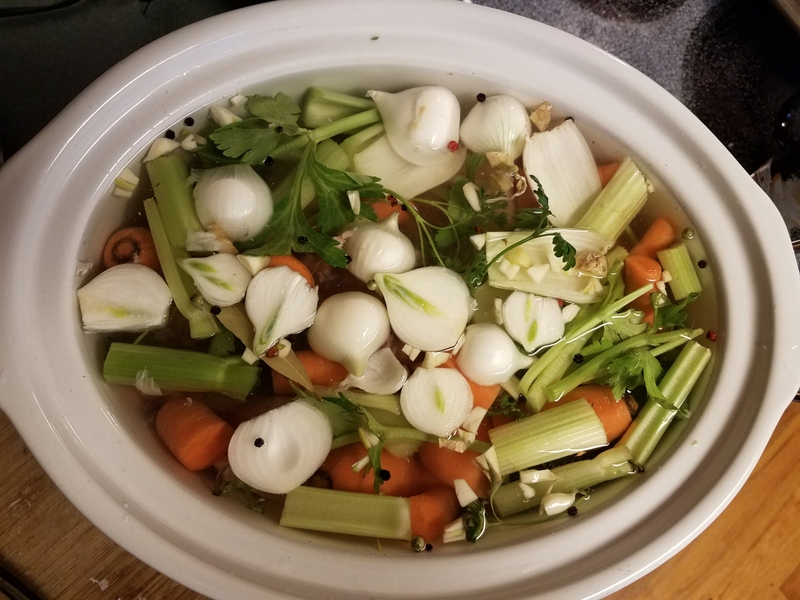 There is a difference between a stock and a broth. A stock uses bones. Where a broth is the liquid that the meat or vegetables are cooked in. Both can have seasoning. 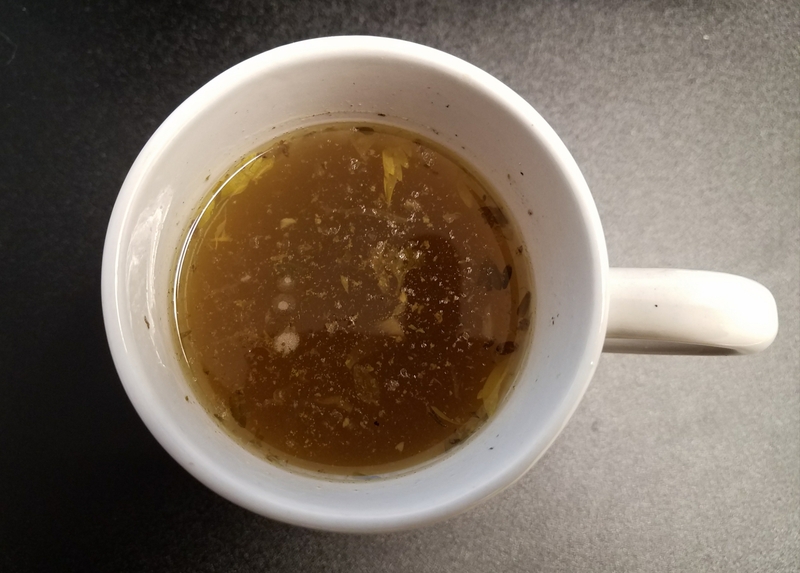 Bone broth is considered to be one of the best healing foods you can eat. It contains nutrients such as gelatin and glycine. Consuming bone broth is said to have healing properties for the hair, skin, joints, pain, gut, digestive tract and the list goes on. Collagen is the protein found in tissue of animals such as cows, chickens, and fish. It is in abundance in bone, marrow, cartilage, tendons, and ligaments. 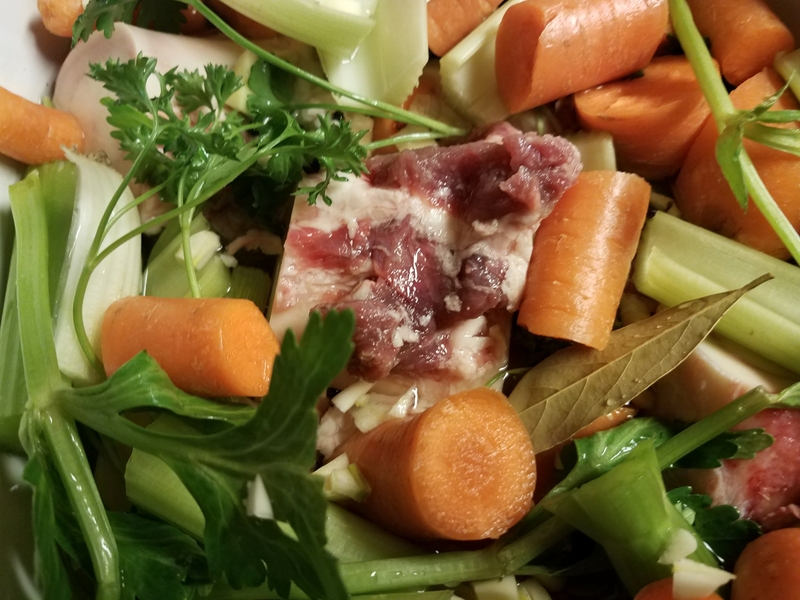 When making bone broth, the collagen is broken down into a gelatin. Drink a good 16 oz. of this broth a day. is thought to pull out the nutrients from the bone. 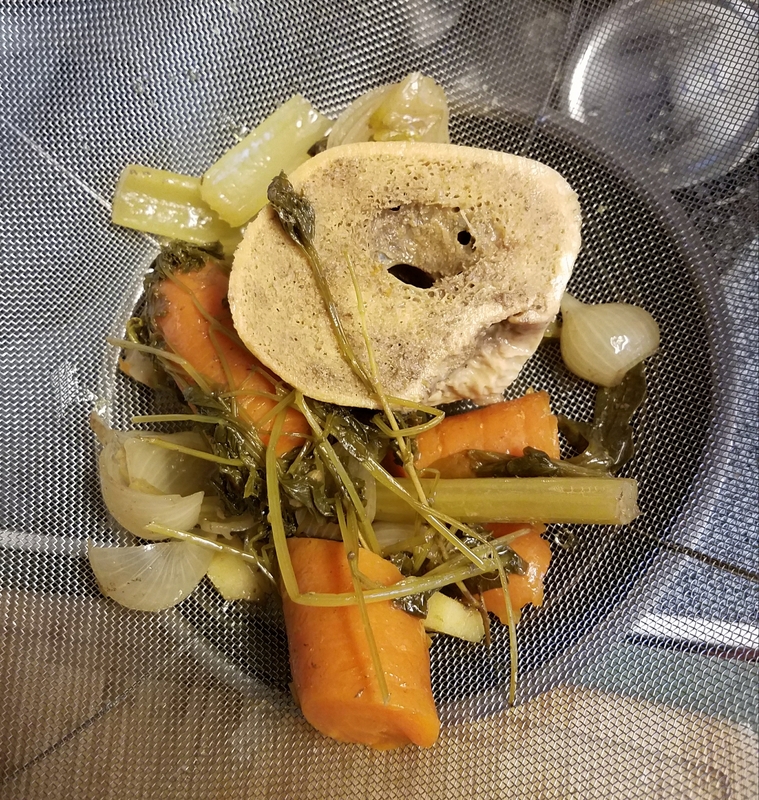 Clean bones and all vegetables by rinsing under cold water. Place all ingredients in at least a 10 quart crockpot. If you do not have a crockpot. A Dutch oven (large stock pot) maybe used. Add filtered or distilled water. Remove from or turn off heat. Cool until you can handle solids. Place a colander or strainer onto of a bowl. 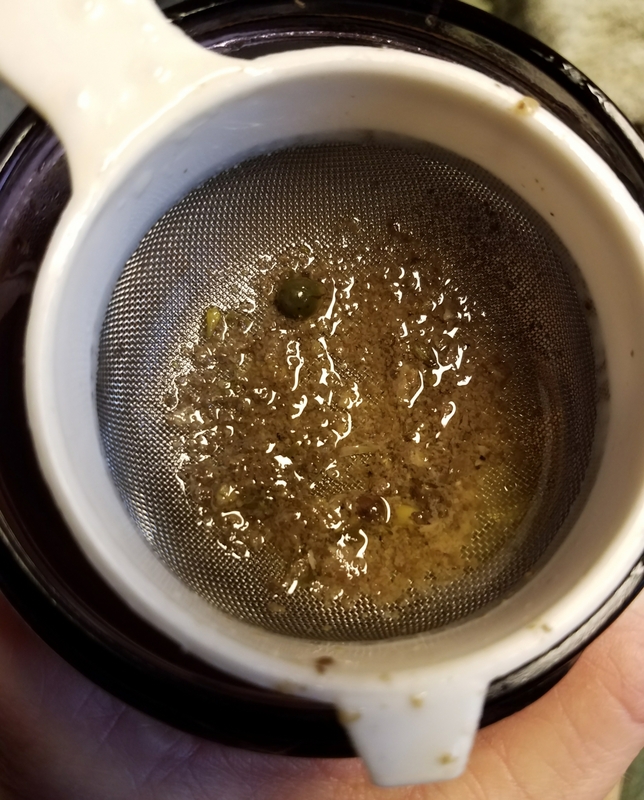 Pour broth into Mason jars through a strainer. Let cool and seal by screwing on lids. Wipe down jar with a clean dish towel. Note when the soup cools. A fatty layer will form on top of the broth. You can remove this fat. Or use some of it in the broth. Using too much can make the broth very fatty tasting. Gently break the fat layer apart with a spoon. To serve, pour some broth into a mug and microwave for about a mintue. Hold back the fat pieces with a spoon as you pour. A little fat in the mug will not make it too fatty. Remember that fat holds a lot of Nutrients. Keep in refrigerate for up to a week. Or freeze up to 3 months. Note: Mason jars can be use when freezing foods. Use wide mouthed canning jars. Use pint or half pint sizes. Do not use plastic. Due to the chemicals in the plastic. Make sure to place in an area of the freezer where items are not being moved around to much. So not to break the jar. When filling the Mason jar, leave a 1-inch head space from the top of the jar. Your contains will expand when frozen. Next Next post: What is With All the Different Salts?